Weather: SE4, variable cloud, thickening slightly for a time in the afternoon. Dry and pleasantly warm. 48 Greylag Goose, 3 Wigeon, 7 Teal, Sparrowhawk, 3 Red-throated Diver (on sea off Linni Geo), Moorhen (Da Water), Whimbrel (Hoini; first of the year), 134 Purple Sandpiper, Woodcock (near Triola Geo), Green Sandpiper (Gilly Burn then Walli Burn; first of the year), Greenshank (Da Water; first of the year), 40+ Bonxie, Razorbill (lots present, including copulating birds at Dog Geo), Puffin (large numbers ashore), 11 Woodpigeon (highest count of the year), Merlin, 8 Carrion Crow, 266 Skylark, 14 Sand Martin (highest count of the year), 18 Swallow (highest count of the year), House Martin (Gilly Burn; first of the year), 20 Willow Warbler (highest count of the year), 44 Chiffchaff (highest count of the year), 7 Blackcap (highest count of the year), 17 Goldcrest (highest count of the year), 3 Ring Ouzel, 18 Blackbird, 10 Fieldfare, 27 Redwing, 23 Song Thrush, 3 Mistle Thrush (highest count of the year), 128 Robin, 6 Black Redstart (highest count of the year), 2 Redstart, 158 Wheatear (highest count of the year by considerable margin), 13 Dunnock, Grey Wagtail, 8 ‘White Wagtail’, 240 Meadow Pipit, 2 Tree Pipit, 51 Rock Pipit (highest count of the year, including two ‘Scandinavian Rock Pipit’), 18 Chaffinch, 11 Brambling, 41 Twite, 5 Linnet, Goldfinch, Siskin, 5 Snow Bunting, 2 Reed Bunting. Weather: still similar, with SE4-5 winds, good visibility and patchy (3/8) cloud, remaining dry. Some busy early trap rounds and obviously more birds in, with several species recording their highest counts of the spring. We said goodbye today to Nina O’Hanlon who stepped in at short notice to help out as a volunteer with census and ringing work at the start of the season. Nina has previously volunteered at FIBO, visited for her research into plastic in Gannet nests (see https:// ninajohanlon.wordpress.com/2018/06/07/ scottish-gannets-and-plastic-nests/) and is a regular birding visitor who we look forward to seeing again soon – thanks for your help Nina. 53 Greylag Goose, Wigeon, 7 Teal, 2 Cormorant, Sparrowhawk, Water Rail (Springfield), Moorhen (Obs scrape), 33 Ringed Plover, Razorbills and Puffins returned in large numbers, 7 Woodpigeon, Merlin, 2 Peregrine, Rook, 7 Carrion Crow, 197 Skylark, 7 Swallow, 6 Willow Warbler, 28 Chiffchaff, 5 Blackcap, 10 Goldcrest, 4 Ring Ouzel, 21 Blackbird, 6 Fieldfare, 18 Redwing, 24 Song Thrush, 153 Robin, 3 Black Redstart, 2 Redstart, Stonechat (male), 76 Wheatear, 9 Dunnock, 3 ‘White Wagtail’, 234 Meadow Pipit, Tree Pipit (Quoy; first of the year), 21 Chaffinch, 9 Brambling, 29 Twite, 5 Linnet, Goldfinch (School). 67 Greylag Goose, Wigeon, 5 Teal, Red-throated Diver, 2 Sparrowhawk, Water Rail (Meadow Burn), c20 Great Skua, very few auks (including no Puffins noted during census), 2 Woodpigeon, Kestrel (male), Merlin (male), Peregrine, Carrion Crow, 270 Skylark, 6 Swallow, 2 Willow Warbler, 21 Chiffchaff, 2 Blackcap, 4 Goldcrest, 2 Ring Ouzel, 18 Blackbird, 3 Fieldfare, 21 Redwing, 4 Song Thrush, 54 Robin, Redstart (male at Setter; first of the year), Stonechat (male), 56 Wheatear (highest count of the year so far), 5 Dunnock, Grey Wagtail, 4 ‘White Wagtail’ (along with 12 Pied and 2 unidentifed alba wagtails, making it the best alba wag day of the year so far), 189 Meadow Pipit, 13 Chaffinch, 9 Brambling, 15 Twite, 3 Linnet, Goldfinch (first of the year), 3 Snow Bunting. 63 Greylag Goose, Wigeon, 7 Teal, Sparrowhawk (male), Jack Snipe (Boini Mire; first of the year), Common Sandpiper (Buness; first of the year), 12 Great Skua, Woodpigeon, Kestrel (male) , Merlin (female), Peregrine, Carrion Crow, 104 Skylark, 2 Swallow, 12 Chiffchaff, 3 Ring Ouzel, 14 Blackbird, 4 Fieldfare, 10 Redwing, 4 Song Thrush, 37 Robin, 2 Black Redstart, 39 Wheatear, 3 Dunnock, Grey Wagtail, 2 ‘White Wagtail’, 107 Meadow Pipit, 17 Chaffinch, Linnet, 6 Snow Bunting, Reed Bunting. 71 Greylag Goose, 2 Wigeon, 8 Teal, Sparrowhawk, Water Rail (Springfield), Woodpigeon, Short-eared Owl (Busta; first of the year), Carrion Crow, 260 Skylark, 2 Swallow, 19 Chiffchaff, Ring Ouzel, 19 Blackbird, 10 Fieldfare, 24 Redwing, 6 Song Thrush, 39 Robin, Black Redstart (North Light), 41 Wheatear, 8 Dunnock, Grey Wagtail, 88 Meadow Pipit, 12 Chaffinch, 2 Brambling, 22 Twite, 4 Linnet, 3 Snow Bunting. ‘White-spotted Bluethroat’: a male briefly at Chalet. 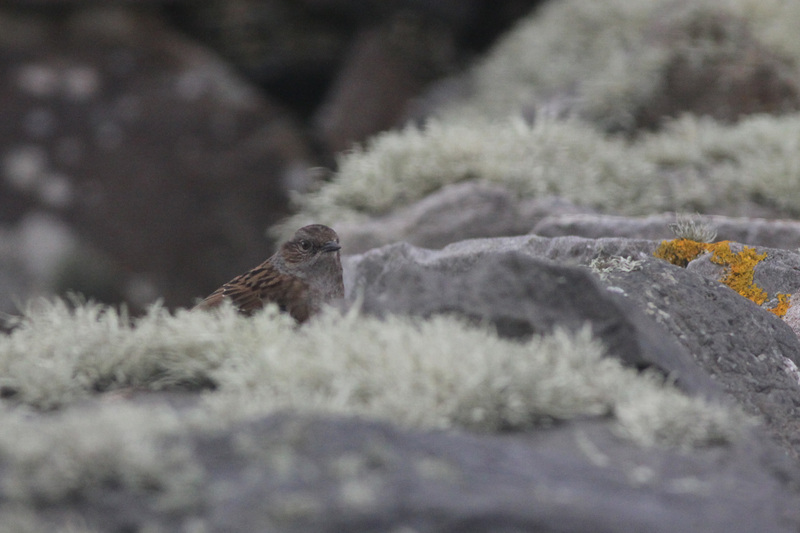 This is the first confirmed record of this subspecies since 2001 (when there were five) and is only the tenth definite record of this subspecies for Fair Isle (although females on 19th April 2002 and 16th April 2011 were also likely to have been of this subspecies; the earliest confirmed ‘Red-spotted Bluethroat’ was a male on 30th April 2014, although most years, this subspecies does not arrive until the second week of May). 85 Greylag Goose, 2 Wigeon, 6 Teal, Red-throated Diver, Sparrowhawk, 45 Purple Sandpiper, Woodcock (Raevas), 3 Woodpigeon, Peregrine, Rook, 2 Carrion Crow, 277 Skylark, Willow Warbler (trapped in Plantation; first of the year and 6 days later than the first arrival in 2018), 14 Chiffchaff, Blackcap, 5 Goldcrest, 4 Ring Ouzel, 23 Blackbird, 11 Fieldfare, 20 Redwing, 6 Song Thrush, 56 Robin, 4 Stonechat, 40 Wheatear, 2 Dunnock, ‘White Wagtail’, 227 Meadow Pipit, 9 Chaffinch, Brambling, 21 Twite, 3 Linnet, 17 Snow Bunting. 66 Greylag Goose, 4 Wigeon, 11 Teal, Red-throated Diver (south Light), Grey Heron, Sparrowhawk, Woodcock (Gully), 3 Woodpigeon, 3 Long-eared Owl (Plantation and Obs), 2 Peregrine, 3 Jackdaw (Barkland; first of the year), 2 Rook, Carrion Crow, 402 Skylark, Sand Martin (Haven; first of the year), Swallow (Brecks; first of the year), 8 Chiffchaff, Blackcap (female), 8 Goldcrest, 2 Ring Ouzel, 47 Blackbird, 58 Fieldfare, 124 Redwing, 19 Song Thrush, Mistle Thrush, 54 Robin, Black Redstart (North Light), 47 Wheatear, 7 Dunnock, Grey Wagtail, 202 Meadow Pipit, 11 Chaffinch, 25 Brambling, 2 Greenfinch, 23 Twite, 5 Linnet, 2 ‘Mealy Redpoll’, 6 Snow Bunting. 103 Greylag Goose, Pink-footed Goose, Wigeon, 7 Teal, 2 Tufted Duck (females), Grey Heron, Moorhen, Puffin, 3 Woodpigeon, Long-eared Owl, Merlin, 2 Peregrine, Rook, 4 Carrion Crow, 308 Skylark, 16 Chiffchaff, 11 Goldcrest, 44 Blackbird, 5 Fieldfare, 27 Redwing, 11 Song Thrush, 69 Robin, Black Redstart (Quoy), Stonechat, 16 Wheatear, 11 Dunnock, 184 Meadow Pipit, 5 Chaffinch, 6 Brambling, 2 Linnet, 7 Snow Bunting. 130 Greylag Goose, Pink-footed Goose, Wigeon, 11 Teal, Tufted Duck (the lingering male was found dead), 2 Grey Heron, 3 Cormorant, Sparrowhawk (female), Water Rail (Kirki Mire), Moorhen (Da Water), 50 Purple Sandpiper, Woodcock, 55 Snipe, 8 Great Skua (numbers building slowly), Woodpigeon, Long-eared Owl (Setter), Peregrine, 2 Rook, Carrion Crow, 418 Skylark, 23 Chiffchaff, 2 Blackcap, 9 Goldcrest, 2 Ring Ouzel, 39 Blackbird, 6 Fieldfare, 10 Redwing, 12 Song Thrush, 85 Robin, Black Redstart (Parks), 49 Wheatear, 13 Dunnock, ‘White Wagtail’, 210 Meadow Pipit, 13 Chaffinch, 11 Brambling, Greenfinch, 31 Twite, 2 Linnet, 11 Snow Bunting, Reed Bunting. ‘Northern Treecreeper’: one foraging on the golf course at the Skadan. Just the 11th Fair Isle record of Treecreeper (all are thought to be ‘Northern’ birds), although the third since 2014 and only the second spring record. 136 Greylag Goose, Pink-footed Goose, 2 Wigeon, 16 Teal, Tufted Duck, Moorhen (Quoy), Woodpigeon, Peregrine, 2 Rook, 3 Carrion Crow, 352 Skylark, 14 Chiffchaff, Blackcap, 3 Goldcrest, 4 Ring Ouzel, 15 Blackbird, 3 Fieldfare, 5 Redwing, 8 Song Thrush, 5 Mistle Thrush, 71 Robin, 4 Stonechat, 10 Wheatear, 11 Dunnock, Grey Wagtail, 2 ‘White Wagtail’, 402 Meadow Pipit, 15 Chaffinch, 4 Brambling, Greenfinch, 55 Twite, Snow Bunting, Reed Bunting. 169 Greylag Goose, Pink-footed Goose, Wigeon, 10 Teal, Tufted Duck, Red-breasted Merganser, 2 Woodpigeon, Merlin, Peregrine, Rook, 2 Carrion Crow, 376 Skylark, 11 Chiffchaff, 3 Goldcrest, 4 Ring Ouzel, 9 Blackbird, 3 Fieldfare, 14 Redwing, 7 Song Thrush, 3 Mistle Thrush, 46 Robin, Black Redstart (a female-type in the Good Shepherd noost; first of the year), 5 Stonechat, 10 Wheatear, 7 Dunnock, 2 Grey Wagtail, 210 Meadow Pipit, 8 Chaffinch, 4 Brambling, Greenfinch, 34 Twite, 4 Snow Bunting. 125 Greylag Goose, Pink-footed Goose, 16 Teal, Tufted Duck, Red-throated Diver (past South Light), Sparrowhawk (female), 164 Common Gull (mostly in Furse), 2 Merlin, 2 Rook, 3 Carrion Crow, 381 Skylark, 9 Chiffchaff, 3 Goldcrest, 2 Ring Ouzel, 10 Blackbird, 2 Fieldfare, 10 Redwing, 16 Song Thrush, 43 Robin, 4 Stonechat, 5 Wheatear, 9 Dunnock, 9 Chaffinch, 2 Brambling, Greenfinch, 35 Twite, Linnet. 141 Greylag Goose, Pink-footed Goose, Wigeon, 15 Teal, Tufted Duck, Red-breasted Merganser, 71 Oystercatcher, 57 Common Gull, Woodpigeon, Kestrel, 2 Carrion Crow, 363 Skylark, 15 Chiffchaff, 10 Goldcrest, 13 Blackbird, Fieldfare, 19 Redwing, 10 Song Thrush, Mistle Thrush, 63 Robin, 6 Stonechat, 5 Wheatear, 5 Dunnock, 2 ‘White Wagtail’ (the first of this subspecies for the year), 178 Meadow Pipit, 8 Chaffinch, 6 Brambling, Greenfinch, 20 Twite, Linnet, 2 Common Redpoll, 10 Snow Bunting. 133 Greylag Goose, Wigeon, 11 Teal, Tufted Duck (male; first of the year), Red-breasted Merganser (first of the year), 2 Water Rail (Plantation and Schoolton), 2 Moorhen (School), 7 Golden Plover, 60 Purple Sandpiper, c350 Puffin, 2 Woodpigeon, Kestrel (male), 2 Merlin, 2 Peregrine, 3 Carrion Crow, 243 Skylark, 43 Chiffchaff (including an ‘eastern-looking’ bird), Blackcap (female Plantation), 13 Goldcrest, Ring Ouzel, 19 Blackbird, 21 Redwing, 5 Song Thrush, 85 Robin, 6 Stonechat, 8 Wheatear, 25 Dunnock, Grey Wagtail (Moss Geo; first of the year), 338 Meadow Pipit, 16 Chaffinch, Brambling, Greenfinch, 29 Twite, Linnet, ‘Mealy Redpoll’, Siskin (first of the year), 2 Snow Bunting, 4 Reed Bunting. First full census of the season after yesterday’s poor weather (NE5-6, although easing later, heavy rain throughout), and it is always a good feeling. A pleasant selection of birds around as well, with five additions to the year list and the first BBRC rarity of the year. 171 Greylag Goose, 3 Wigeon, 16 Mallard, 13 Teal, Grey Heron, Sparrowhawk, Water Rail (Double Dyke), 66 Oystercatcher, 7 Lapwing, 2 Golden Plover, 25 Ringed Plover, 9 Curlew, 101 Turnstone, 90 Purple Sandpiper, 27 Snipe, 34 Redshank, Kittiwake (including on a cliff ledge), 34 Common Gull, 6 Lesser Black-backed Gull, Puffin, 2 Woodpigeon, Kestrel (male), 2 Merlin, 3 Carrion Crow, 294 Skylark, 8 Chiffchaff, Blackcap (male Schoolton; first of the year and 7 days earlier than 2018), 12 Goldcrest, Ring Ouzel (male Gilsetter; first of the year and 4 days earlier than 2018), 12 Blackbird, Fieldfare, 15 Redwing, 10 Song Thrush, Mistle Thrush (first of the year), 47 Robin, 8 Stonechat (the highest count since at least 1991), 6 Wheatear, 10 Dunnock, 10 Pied Wagtail, 83 Meadow Pipit (including singing birds), 31 Rock Pipit, 11 Chaffinch, 3 Brambling, Greenfinch (female at various sites before settling at School; first of the year), 39 Twite, ‘Mealy Redpoll’ (male South Harbour), 7 Snow Bunting, 2 Reed Bunting. Shelduck (3rd; first of the year), 5 Wigeon, 4 Teal, Grey Heron (3rd), 2 Golden Plover, 9 Purple Sandpiper, 3 Black-headed Gull, 6 Lesser Black-backed Gull, Great Skua (singles on 1st and 3rd; first of the year), Woodpigeon, Merlin, Peregrine, 3 Carrion Crow, 2 Chiffchaff (3rd), 4 Goldcrest (3rd), 11 Redwing, 2 Song Thrush, 8 Robin, Stonechat (male ,3rd), Wheatear (male at Restengeos on 3rd; first of the year), 2 Dunnock, 2 Chaffinch, Brambling (2nd), Linnet (2nd), 7 Snow Bunting. Weather: Still largely a blustery SW wind, although a calmer day on 31st saw the Good Shepherd able to sail for the first time in nearly two weeks. Rainy spells and some wintry showers during times when the wind had gone more NW. 178 Greylag Goose, 2 Wigeon, 15 Teal, Long-tailed Duck (Furse, 28th), Sparrowhawk (female from 28th; first of the year), 17 Ringed Plover, 6 Purple Sandpiper, 2 Woodcock (28th), 4 Black-headed Gull, 4 Lesser Black-backed Gull, Guillemot (lots present from 28th), Razorbill (lots present on 28th with several again on 31st), Puffin (the first on Ditfield on 27th with birds on land on 30th), 3 Woodpigeon (peak on 31st), Merlin, 2 Carrion Crow, 180 Skylark (a single flock at Barkland on 27th, sightings elsewhere on the Isle during the period suggested at least 400 present), Chiffchaff (one in the Gully on 29th; first of the year), 3 Goldcrest (numbers building to a peak on 29th), 9 Blackbird (a few caught in the traps suggested light movement), 6 Fieldfare, 3 Redwing, 2 Song Thrush, 2 Robin, Stonechat (female North Shirva area 27th-28th), Dunnock (one at School on 29th, with numbers increasing to 4 on 31st; first of the year), 3 Pied Wagtail, Meadow Pipit (large numbers by the end of the month), 2Chaffinch (29th, one still on 31st), 18 Twite, Linnet (at School on 31st; first of the year), 4 Snow Bunting, Reed Bunting (female 29th). Weather: some cold and windy conditions, with SW gales on 23rd, although some pleasant sunny spells as well and relatively calm on 25th. 127 Greylag Goose, 7 Whooper Swan (Da Water 24th-25th), Shoveler (male on Da Water and Boini Mire 22nd-24th; first of the year), 16 Teal, Red-throated Diver (east past South Light on 22nd; first of the year), Water Rail, Golden Plover (displaying over Chatham's Land 22nd), 17 Ringed Plover, 8 Purple Sandpiper, Snipe (present throughout but one at North Light on 22nd may have indicated passage), 60 Redshank, 5 Black-headed Gull, Lesser Black-backed Gull (one on 21st building to 3 by 24th; first of the year), 3 Woodpigeon (peak on 22nd), Kestrel (23rd), Rook (2 from 22nd; first of the year), 3 Carrion Crow, Goldcrest (one at Vaadal and Plantation 24th-25th; first of the year), 'Fair Isle Wren' (first song of the year noted on 21st at Obs), 8 Fieldfare, 3 Redwing (including one at North Light on 22nd), 2 Song Thrush (including one on Ward Hill on 25th), 3 Robin (Obs), Stonechat (female Schoolton 24th-25th), 2 Pied Wagtail (including one singing at North Haven on 25th), 20 Meadow Pipit (passage increasing throughout with at least 20 on 25th), Chaffinch (male still at Obs 21st), Brambling (male at Schoolhouse 24th; first of the year), Snow Bunting (3 at Barkland 24th-25th), Reed Bunting (Burkle and Schoolton 23rd-24th). Weather: largely uninspiring for migration, although one or two spells of more spring-like weather. Largely NW or W based winds, sometimes strong, with some showery days. 'Greenland White-fronted Goose' (adult 17th), 4 Whooper Swan (called through Da Water on the morning of 20th), 13 Wigeon, Mallard (copulating noted from 16th), 11 Teal, Grey Heron (one over the Haven on 18th; first of the year), 2 Water Rail, Lapwing (several displaying pairs), Golden Plover (one displaying over Lower Stoneybrek on 20th), 7 Ringed Plover, 8 Common Gull, 2 Woodpigeon (from 15th), Kestrel (18th, presumably the wintering bird), Merlin, Peregrine (20th), 2 Carrion Crow, 5 Blackbird, 12 Fieldfare, Song Thrush, Pied Wagtail, 2 Meadow Pipit, Chaffinch (male at Obs on 20th; first of the year). Weather: A typical early-spring mixed-bag, with some milder weather, but snow on 9th (that was good enough for sledging) before a sunny day on 10th then, after some SW winds, a spell of cooler NW or N winds, with some wintry showers. Birding was obviously effected by the fire that destroyed the Obs on 10th. The effects of the fire are covered elsewhere on the website, but thankfully nobody was hurt and the ornithological work will quickly resume and carry on as normal this year. 117 Greylag Goose, 11 Wigeon, 11 Teal, Common Scoter (Furse, 8th), Great Northern Diver (South Harbour, 9th), 2 Water Rail, 33 Oystercatcher, 6 Lapwing, 10 Ringed Plover, 21 Curlew, 235 Turnstone, 50 Purple Sandpiper (minimum on 7th), 2 Black-headed Gull, 12 Common Gull, Razorbill (small numbers present on 14th; first of the year), Woodpigeon, Merlin (female around the North), Peregrine, 2 Carrion Crow, 6 Blackbird, 15 Fieldfare, 2 Redwing, Song Thrush, Stonechat (male until 13th), Pied Wagtail, Meadow Pipit (14th), 8 Twite, 12 Snow Bunting. Weather: starting rather mild, with light south-westerly winds. Cooler towards the end of the period, a with northerly airflow. Heavy rain around 3rd, although largely dry. 184 Greylag Goose, 'European White-fronted Goose' (5th), Wigeon, 23 Mallard (several pairs now in breeding habitat), 16 Teal, 3 Water Rail, 26 Oystercatcher, 13 Lapwing, 2 Golden Plover, 32 Ringed Plover, 22 Curlew, 171 Turnstone, Purple Sandpiper, 40 Redshank, 11 Common Gull, Kestrel (one at Furse on 5th was presumably the elusive wintering bird and appeared to have been 'Fulmared'), Merlin (immature male), Peregrine (5th), 3 Carrion Crow (all the regular wintering birds still present), 220 Skylark (numbers continuing to build), 7 Blackbird, 7 Fieldfare, 2 Redwing, 3 Song Thrush, 3 Robin, 3 Stonechat (highest count of two, but males at Stackhoull, Hill Dyke and Obs), 20 Twite, 4 Snow Bunting (Barkland 4th, with one the following day). Weather: largely uneventful, with milder conditions towards the end of the month. 180 Greylag Goose, Pink-footed Goose, Whooper Swan, 18 Wigeon, 30 Mallard, 16 Teal, Gannet (on ledges on Sheep Rock from 5th), 6 Water Rail (highest daily count of 3, but locations of sightings suggested 6 present), Moorhen (6th-7th Meadow Burn; first of the year), 20 Oystercatcher (numbers rising steadily through the month), 9 Lapwing, 2 Golden Plover (from 2nd; first of the year), 31 Ringed Plover (first seen on 15th, peak count on 28th; first of the year), 22 Curlew, 160 Turnstone, 5 Purple Sandpiper, 50 Redshank, 2 Black-headed Gull (from 12th; first of the year), 11 Common Gull, Guillemot (on cliffs from at least 27th), Woodpigeon (from 19th; first of the year), 2 Merlin, Peregrine (24th), 2 Carrion Crow, Skylark (7 on 15th then numbers increasing to 100 by 24th, with singing from 26th; first of the year), 25 Blackbird, 30 Fieldfare (an arrival on 7th, but few left by end of month), 50 Redwing (arrival on 7th, but just single figures by the end of the month), 5 Song Thrush (peak on 27th, all from Chalet north, so potentially a small arrival), 3 Robin (Schoolton, Haa and Obs), Stonechat (from 14th, with 2 on 25th; first of the year and joint-earliest ever record), Pied Wagtail (22nd, then 2 at Obs on 28th; first of the year), 50 Twite (2nd, with up to 30 later in month), 2 Snow Bunting (19th, with one on 28th; first of the year), Reed Bunting (male 19th-20th; first of the year). 'European White-fronted Goose', 9 Wigeon, 2 Teal, Long-tailed Duck (Ditfield), Water Rail (Utra), 3 Oystercatcher, 7 Purple Sandpiper, 24 Rock Dove (Obs only), 3 Carrion Crow, 13 Fieldfare, 28 Redwing, 2 Song Thrush, 2 Robin (Obs and Haa), 25 Twite. A nice bonus for the year list, with the first 'Any Other Species' for Log of the year (not quite one that was requested in the last sightings round up, but close!). That's it for the latest sightings page now until the end of February, as the Obs will be shut whilst we're away. There'll still be plenty of people watching the Isle though, with ex-Obs' residents Deryk, Nick and Elizabeth keeping an eye out, and when the island includes other observers like Stewart, Kenny (who has found Great Bustard and Brown-headed Cowbird), Tommy (Citril Finch), plus a number of others who may not claim to be birders but have found Gyr Falcons, Snowy Owls and plenty else between them, then there should be interesting sightings (but spare a thought for the Parnabys if you see anything too rare reported on Fair Isle in the next four weeks!). Weather: after a couple of days of NW winds, a very calm day on 23rd saw a lot of ice, which gave way to strong NW winds again on 25th. Wintry showers, with some heavy rain. 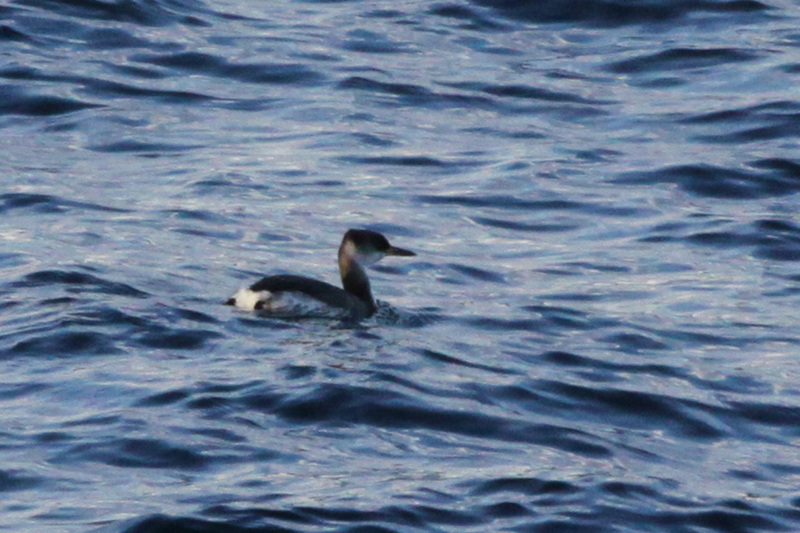 Red-necked Grebe: one in South Harbour on 23rd-24th was the 26th for Fair Isle, but just the third in the last ten years and the first since 2011. Pink-footed Goose, 'European White-fronted Goose' (one on 21st was the first record since 2nd, so was presumably a new bird), 9 Wigeon, 12 Teal, Long-tailed Duck (Ditfield 23rd), 2 Water Rail (Shirva and Skerryholm), 2 Oystercatcher, 28 Purple Sandpiper, 2 Woodcock (Obs 23rd), 2 Carrion Crow (South Light area), Robin (Obs), 30 Twite (Meoness). A variety of weathers, but very little in the way of change on the birding front. 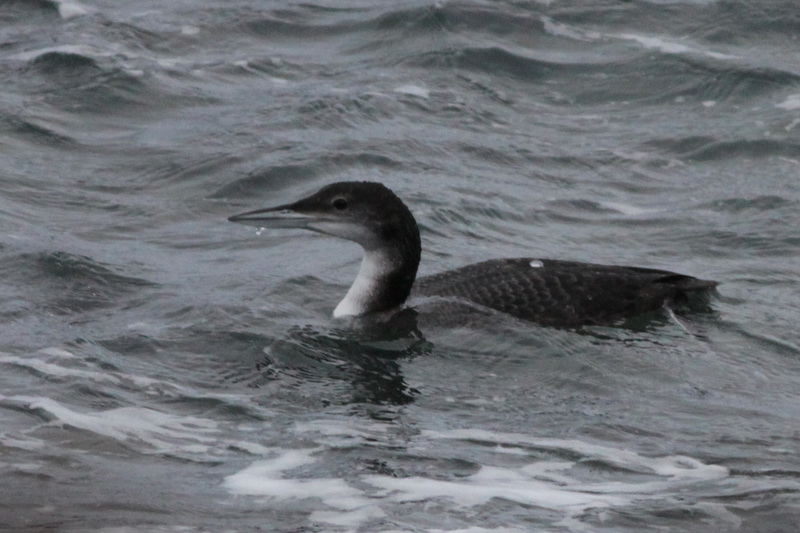 Not even so much as a Little Auk in some whacking great northerlies. It's not been bad for the time of year, but for a decent challenge to the year list record you want a few surprises in the winter. In the record year (2014, with a final total of 220 species) January produced Velvet Scoter, Pochard, Coot, Little Gull and Tundra Bean Goose - all less than annual species. We've actually got two of these already this year, but we could do with a sneaky Smew, Great Crested Grebe or Snow Goose to liven things up a bit! Weather: some milder weather with westerly winds, but a significant northerly blast and some wintry showers and icy conditions. Pink-footed Goose, Whooper Swan (commuting between Golden Water and Suka Mire), 13 Wigeon, 7 Teal, Great Northern Diver (South Harbour until 16th at least), 2 Water Rail (minimum), Oystercatcher, 2 Lapwing (Da Water, 20th), 240 Turnstone, Woodcock (Suka Mire, 17th; first of the year), Merlin (at least one, probably two), 3 Carrion Crow (all 'resident' birds), 12 Fieldfare, 30 Redwing (an apparent increase), 3 Song Thrush, 3 Robin (Obs and 2 at Utra), Meadow Pipit (17th; first of the year), 23 Twite (Barkland still). Weather: westerly winds, often with a northerly element; cold at times and snow showers on 14th. Pink-footed Goose, Whooper Swan (Golden Water), Wigeon, 7 Teal, Common Scoter (Furse), Long-tailed Duck (Ditfield 15th; first of the year), Great Northern Diver (still in the South Harbour and South Light area), Cormorant (still in South Harbour), Water Rail (Burkle), Oystercatcher (4 on 12th then at least two after; first of the year), Lapwing (Da Water), 241 Turnstone (12th), Merlin (present through, seen to kill a Fieldfare on 12th), Carrion Crow, Robin (Obs), 23 Twite (Barkland from 13th). The decorations came down, the kids went back to School (on 8th), the Good Shepherd IV sailed a couple times, flights restarted and the year generally got going again. The birding was pretty slow though, with no significant arrivals and just a trickle of new birds for the year list. Weather: some strong north-westerly winds and some calmer days, cloudier towards the end of the period. The decorations came down, the kids went back to School (on 8th), the Good Shepherd IV sailed a couple times, flights restarted and the year generally got going again. The birding was pretty slow though, with no significant arrivals and just a trickle of new birds for the year list. Pink-footed Goose, Whooper Swan (Golden Water), 14 Wigeon, 2 Teal, Common Scoter (Furse), Great Northern Diver (Mid Geo and South Harbour), Cormorant (2CY South Harbour, 10th), 3 Water Rail (Schoolton, Kenaby, Chalet), Lapwing (Da Water), 26 Curlew, Common Guillemot (reasonable numbers offshore on 10th), Long-eared Owl (Chapel Plantation, 10th), Merlin, Blackbird (9 at Obs on 9th suggested some small movement), 13 Fieldfare, 15 Redwing (at Chalet only on 9th), 4 Song Thrush, 2 Robin, 4 Twite, Common Redpoll (Barkland, 9th). Pink-footed Goose, 'European White-fronted Goose', Great Northern Diver (South Harbour, 2nd), Water Rail (Schoolton), Lapwing, Kittiwake (adult North Haven, 2nd), 6 Common Gull, Common Guillemot (2 on 2nd and small numbers offshore on 3rd), Merlin (Utra, 3rd). And so it begins! Welcome to a New Year and all the excitement that brings. The conditions didn't seem to have brought much new, but from a year-listing perspective, some of the lingering birds were very welcome. Weather: Cold, with a strong WNW wind that had eased slightly from the very windy overnight conditions. Showery, with some of these being wintry. 307 Greylag Goose, 1 Pink-footed Goose, 'European White-fronted Goose' (one again feeding with the Tundra Bean Goose amongst Greylags at Nether Taft), Whooper Swan (Golden Water), 8 Wigeon (Golden Water), Mallard, 10 Teal, Eider, Common Scoter (female, North Haven), Fulmar, Gannet, Shag, Lapwing (Da Water), 10 Curlew, Turnstone, 2 Purple Sandpiper (Leestit), Snipe, Redshank, 4 Kittiwake, Common Gull, Great Black-backed Gull, Herring Gull, Tystie, Rock Dove, Kestrel (the wintering bird seen over Gilsetter), Merlin (South Light), Peregrine (adult over Gilsetter), 3 Carrion Crow (2 wintering birds at Utra and one near Pund), 15 Hooded Crow, Raven, 'Fair Isle Wren', Starling, 17 Blackbird, 13 Fieldfare, 22 Redwing, 4 Song Thrush, 2 Robin (Obs and Utra), House Sparrow, Rock Pipit, . 2 Robin (Obs and Utra), .